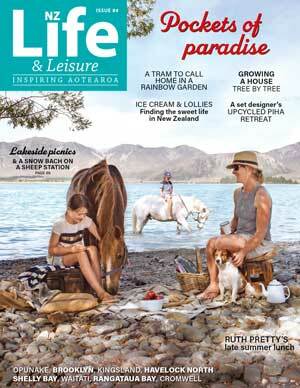 Sabine Ruijters from Odeyssia Stables takes NZ Life & Leisure’s Yolanta Woldendorp for a horseback ride to remember in Crete and talks about her role as a guide. Living in a cave for a year to prove devoutness holds no appeal to a horse rider on Greece’s largest island – even if drinking stalagmite water is said to guarantee male offspring. My horse picks his way up a narrow rocky path on Mount Louloudaki in the Dikti ranges of north-eastern Crete, Greece’s largest island. Above the mountain, the vultures wheel in the sky, circling. Our small group is riding through the arid landscape to the cave of Agia Fotini, a place of worship and refuge. It is here that a monk lived for a year in total darkness and a pilgrim came looking for solitude in which to dedicate her life to God. Luckily for her, in this harsh environment 760m above sea level, the Virgin Mary appeared and created a cave in which the saint could live. According to tradition, women who are finding it difficult to fall pregnant make a pilgrimage to pray in this cave and drink the water dripping from the roof. 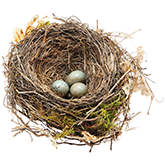 It is said to enhance their chances of bearing sons. When our horses can’t safely go any higher, we dismount, from there making our way on foot up unnervingly steep hewn steps worn smooth by centuries of worshippers visiting the sacred cave. Old wooden railings zigzag past gnarly trees that cling for dear life to the rock face. Our guide Milou leads us up into the Dikti ranges. I turn at the entrance to the cave to take in the spectacular views of the village of Avdou and surrounding plateaus; the Aegean glints blue on the horizon as I make a coin offering for a candle to light my way – and walk into the dark void. The entrance is marked by a bell, as with all churches in this barren land. However, this ‘church’ was made by nature and no one knows how long it has been a site of worship. In the 16th century, villagers hid their valuables deep inside the cave to protect them from the invading Turks. The pulleys with which they winched their prized possessions to safety in its highest crevices are still here. German riders Karin and daughter Yasmin, my friend Odessa and guide Milou about to be illuminated by the ancient stories that reside deep inside this cave. Fifty metres inside it is cold and eerie – so many clambering hands and feet have gone before me – and my candle flickers just enough to reveal the altar of Santa Fotini. Two massive stalagmites, like giant kauri trees, create its form and on it, an oil lamp burns in perpetuity. Above, a gilded chandelier hangs from the roof and the beaten silver frames of saints’ portraits that line the walls glitter in the light. In the middle of the chamber is a large pottery urn which our riding guide Milou tells us is for catching water that drips from the roof. 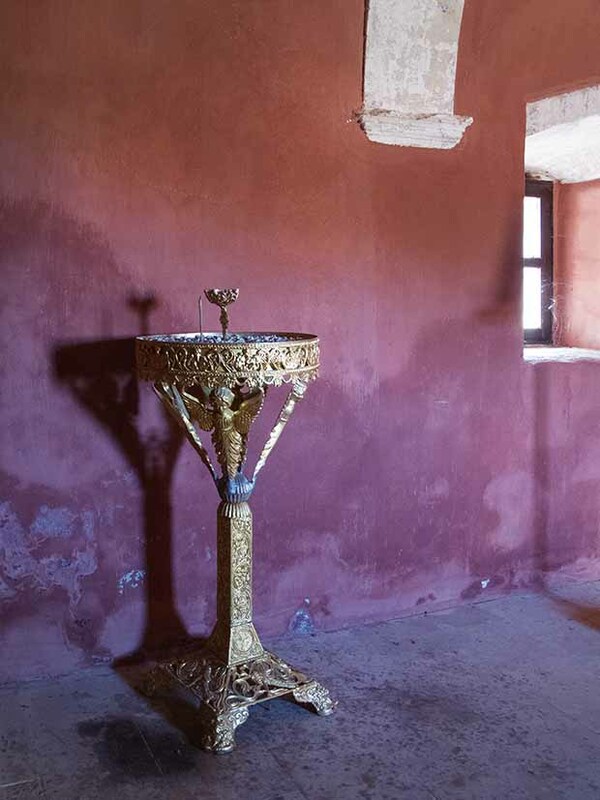 This is the holy water worshippers come to touch believing its powers to heal and promote the conception of sons. I give it a wide berth – I’m not that thirsty. Dutch guide Milou Hinssen sponges down her horse after a day in the saddle. Each rider is responsible for brushing and saddling their horse and, at the end of day washing them down and returning them to the solar-powered stables. This is also where the monk lived for all those days in darkness so we blow out our candles to imagine what it was like. We are enveloped in velvet blackness. Apart from the drip drip drip of water, it’s deadly silent. The monk, apparently, lasted 365 days – we survive two minutes. That was enough darkness. After such an illuminating (if short-lived) period of reflection, we head out into the blinding light of day. 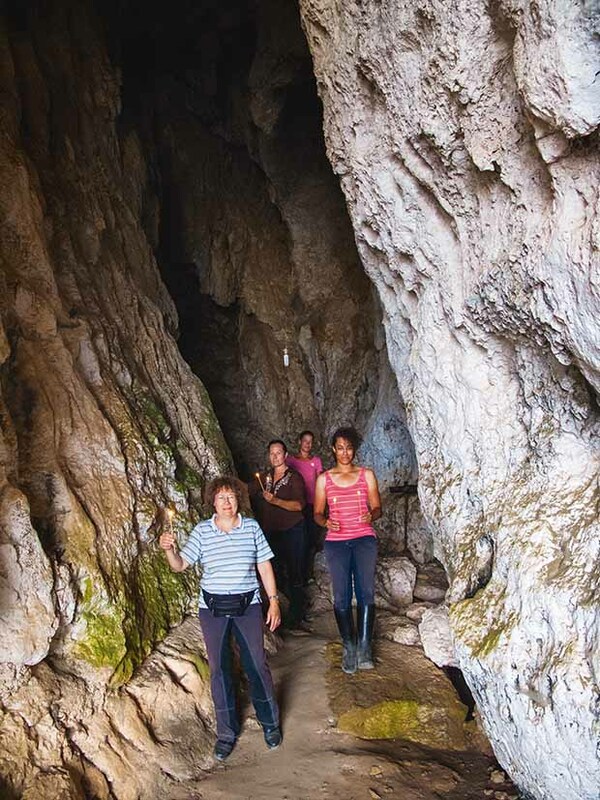 Milou, Karin, Yasmin and Odessa resort to two legs for the final rocky climb to reach the cave of Agia Fotini. Pristine-white Greek Orthodox churches dot the mountainous landscape among never-ending olive groves and mitata (shepherds’ dry stone huts). We ride through dry terrain where pretty dragon flowers poke their heads up through the rugged undergrowth. The clip-clop of our horses’ hooves mixes with the tinkle of goats’ bells in the distance and echoes, timelessly, down the valley. 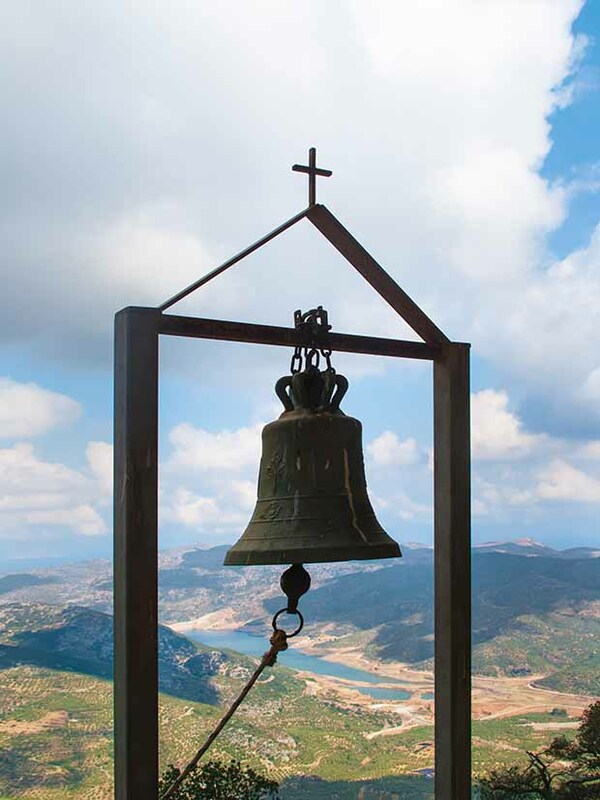 A bell that marks the entrance to the holy cave frames a view of the Mochos plateau and dam of Aposelemis. Today it’s 26°C, a full 10 degrees cooler than recent days, and our ride is pleasant. 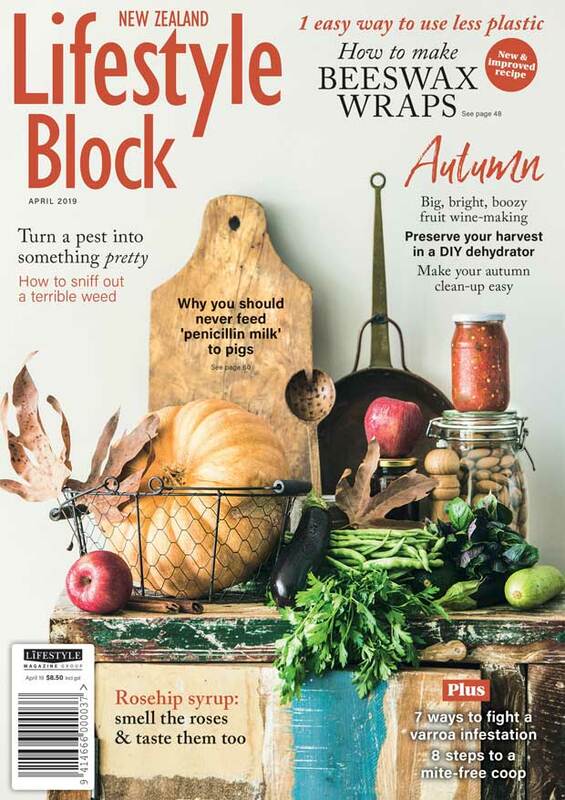 We canter along dusty trails past farmers picking grapes and tending herds of goats and sheep. We follow a Roman aqueduct dating back to 200BC, dwarfed by the impressive rock wall, as we head towards Odysseia Stables and Country Hotel Velani – our home for the next week. 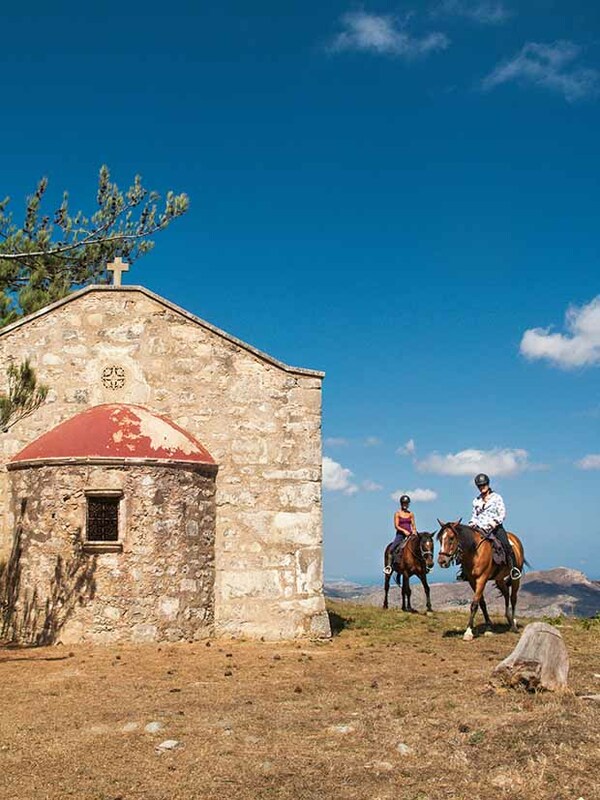 Cretan Manolis Fragkakis and his Dutch wife Sabine Ruijters established the stables and hotel on his family’s 80ha olive plantation in 2006 after many years of taking keen riders into the mountains. With Sabine as our guide, we ride through the local town of Avdou and past more churches on our way to the other side of the valley. 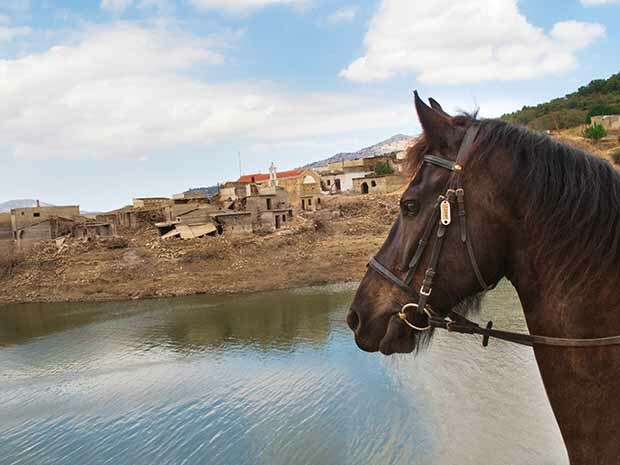 The Greek islands aren’t known for equine bloodstock so Sabine imported horses from Holland, Spain and Athens. She trained them all in a purpose-built arena to be fine, responsive mounts. With no infrastructure here for horse welfare, Manolis is a self-taught farrier, equine dentist and general vet all rolled into one. The couple grows most of their own food for the restaurant. 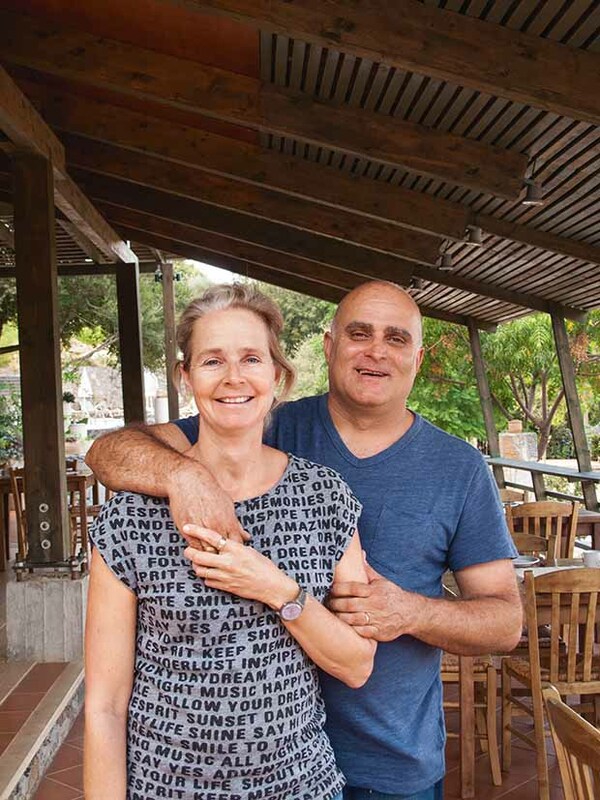 Manolis, an ever-so-resourceful host, built his Greek oven and produces the most delicious traditional Cretan dishes layered with his own olive oil. It’s foodie heaven after a day in the saddle. Walley stops for a well-deserved drink at the dam of Aposelemis which overlooks one of the abandoned silt-covered towns that was destroyed in the formation of the dam. 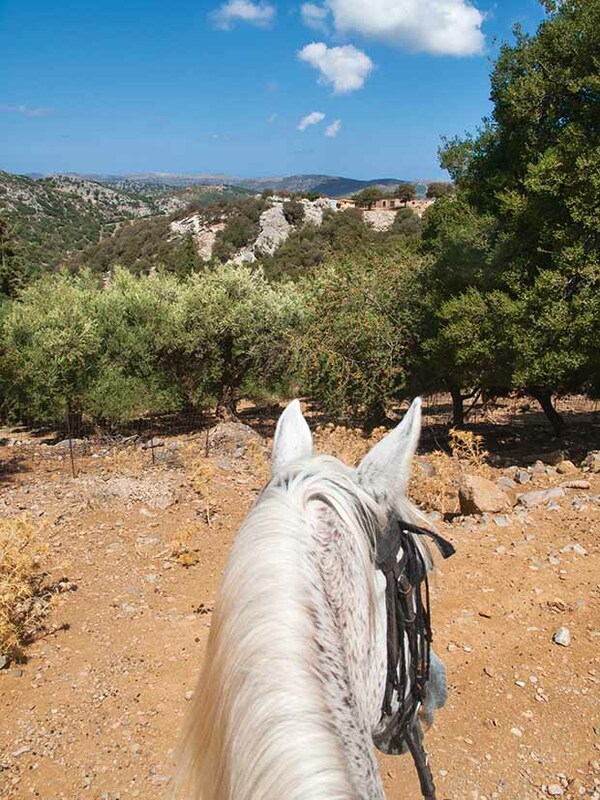 While Odysseia stables has many riding options (including an adventurous 200km round-trek to the Libyan Sea for experienced riders), I only had time for day excursions. One day, I rode out with Sabine as guide. Before she met Manolis in 1995 on the coast of Crete, she was a top dressage competitor. Now she juggles her love of riding with caring for their two children Maria, 9, and Elena, 5, who, of course, have ponies of their own. 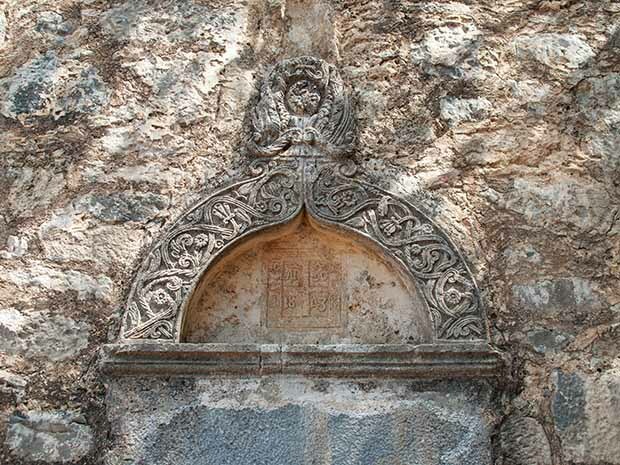 A detail of a carved stone that marks the entrance to a church high on the mountain is enscribed 1843. 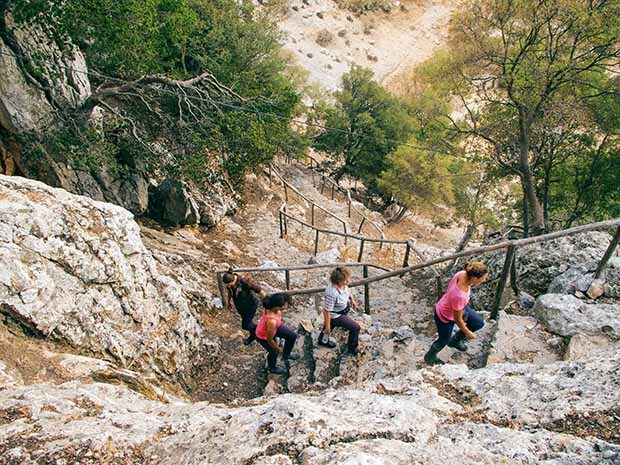 Sabine leads us on a trek through the village of Avdou and around the peaceful Lagada Valley, a lifetime away from the tourist playgrounds and nightclubs of Crete’s capital – Heraklion. Lagada is now known for hiking, paragliding and bird watching, but was once the site of ancient civilizations in the time of the Minoans and Romans. Inside this stone church was peaceful and cool, a welcome relief from the heat of day. 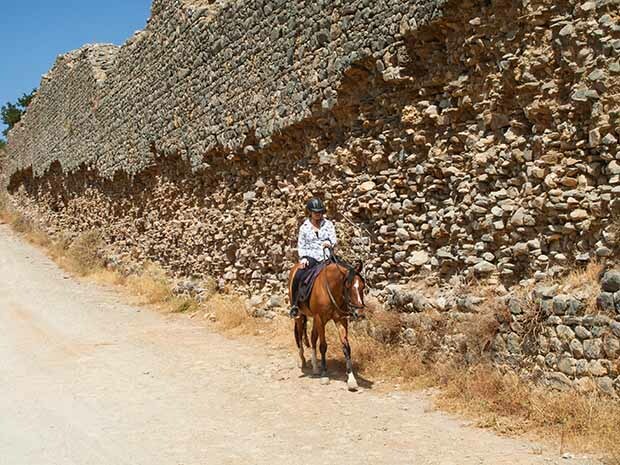 The dam was built to supply the ever-growing tourism demands and its rising and falling waters have revealed Minoan ruins, very clearly seen from the elevation of horseback. Odessa and her horse are dwarfed as they follow the remains of a 200BC Roman aqueduct, most of which has either collapsed or is underground. We rest awhile at another church, this time on the other side of the 62m dam wall. This building is protected from the potential dangers of rising water by a stone surround. The Church of St Constantine and Helena dates back to the Byzantine era and was built in 1425-1448 during the reign of Emperor John VIII Palaeologus. It is a vaulted design with a single aisle and an interior rich with frescoes. Catholic churchgoers would flock to buildings such as these for leadership and a sense of the spiritual, but here, trekking through an ancient landscape and lost in reverie only a rider can appreciate, I didn’t need holy architecture or sacred waters in a deep dark cave to feel at peace. I found that heaven on horseback. The view from the saddle on my trusty steed, Evropi, takes in olive trees bearing fruit ready to harvest in three months’ time. 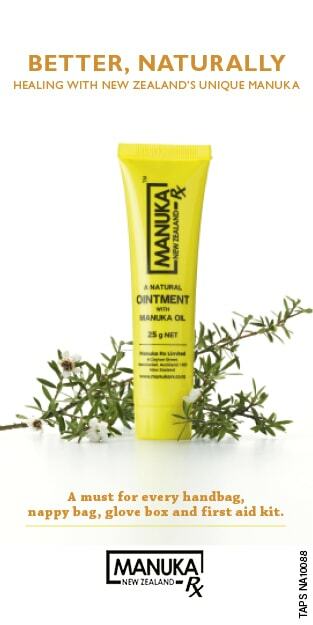 Crete produces premium extra virgin olive oil and olive cultivation dates back to 4000BC. Many Cretan farmers have literally grown up alongside their trees as the land is passed down from generation to generation. Manolis Fragkakis and Sabine Ruijters at Velani. Manolis cooks with the olive oil from his family’s olive trees and organic produce grown in front of the horse arena. How to get there: Fly from Athens to Heraklion on Olympic Air (about $60 to $90 each way) or go by ferry from Piraeus (which takes nine hours but is no cheaper). Odysseia Stables offers transfers from the airport for about $80 one way. What to do: Horseriding, of course. 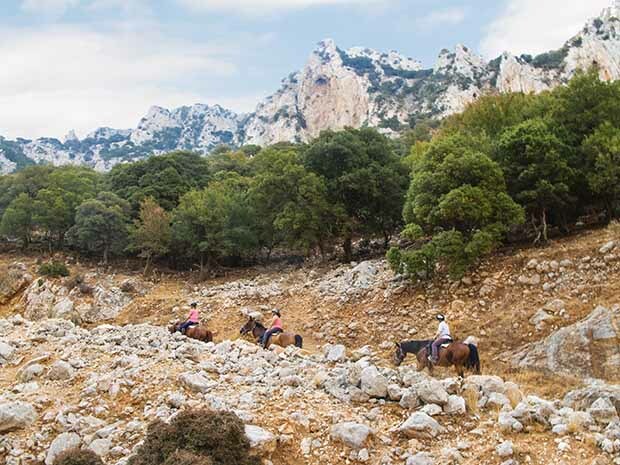 See horseriding.gr for more details on packages. 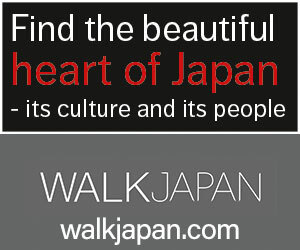 They range from day rides (about $135) to one-week guided treks. Full accommodation, food and riding packages are available. If you just wish to relax or explore the area by foot or bicycle that is also possible plus there are cooking lessons, bird-watching excursions, and a swimming pool and spa treatments. Read more of Manolis’ traditional greek recipes here.